Martín Rico (1833–1908), La Torre de las Damas en la Alhambra de Granada (The Tower of the Ladies in the Alhambra) (1871-72), oil on canvas, 62.5 x 39 cm, Museo Nacional del Prado, Madrid, Spain. Wikimedia Commons. Given the very pleasant climate of Granada and the Alhambra, by rights it should have been painted as much as the Roman Campagna, which in the eighteenth century was the cradle of plein air oil painting, and the high school for landscape art in Europe. Yet the great pioneer landscape painters, such as Poussin and Claude, spent much of their careers in Rome. Landscape painting in Spain was not exactly at the forefront, and Diego Velázquez seems to have painted more landscapes when he was in Italy than during the remainder of his career in Spain. José de Hermosilla (1715-1776), View of the Alhambra from the Torres Bermejas Castle (1767), watercolour, dimensions not known, Real Academia de Bellas Artes de San Fernando, Madrid, Spain. Wikimedia Commons. 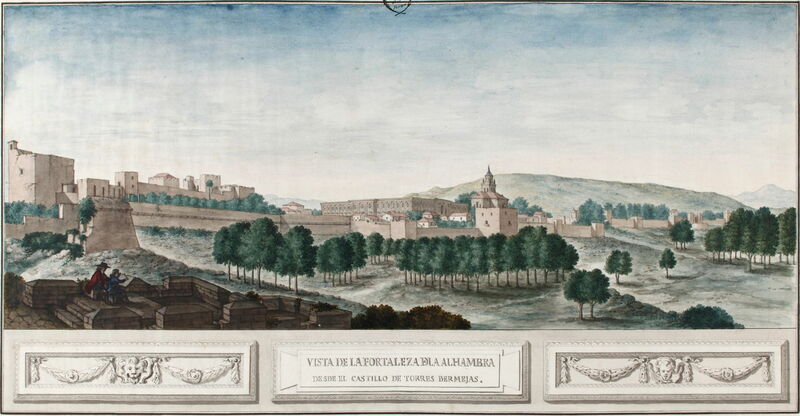 Early paintings of the Alhambra were mainly formal topographic views, painted in watercolour during the eighteenth century, such as José de Hermosilla’s View of the Alhambra from the Torres Bermejas Castle of 1767. These are similar to the views of landmarks which were being produced in Britain at the time. John Frederick Lewis (1805–1876), The Torre de Comares, Alhambra (1835), graphite, watercolour, white gouache and scratching out on medium, slightly textured, gray wove paper, 37.1 x 27 cm, Yale Center for British Art, New Haven, CT. Wikimedia Commons. 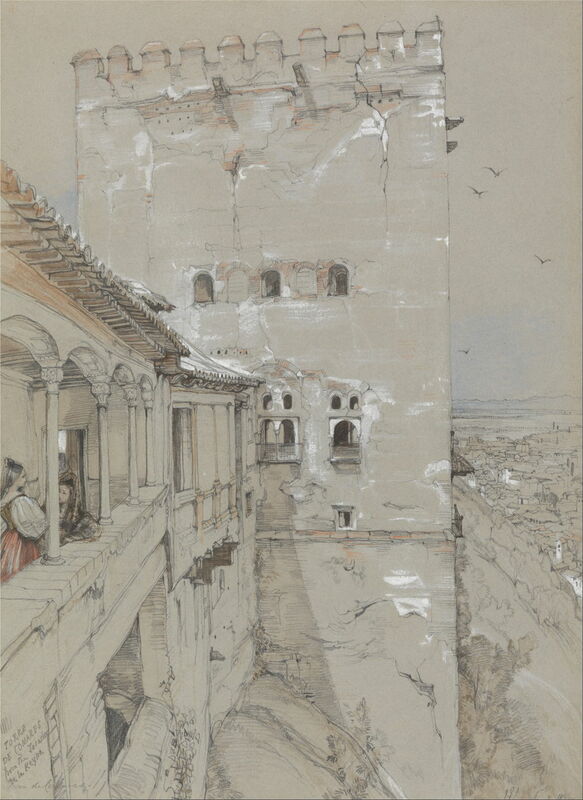 Others, like John Frederick Lewis in 1835, came to record details of the remains of the Alhambra’s buildings, as in The Torre de Comares, Alhambra, drawn carefully in graphite and only slightly highlighted and coloured with watercolour and gouache. While every seriously aspiring landscape painter was flocking to paint en plein air in the Roman Campagna in the early nineteenth century, the Alhambra seems not to have been in the circuit. 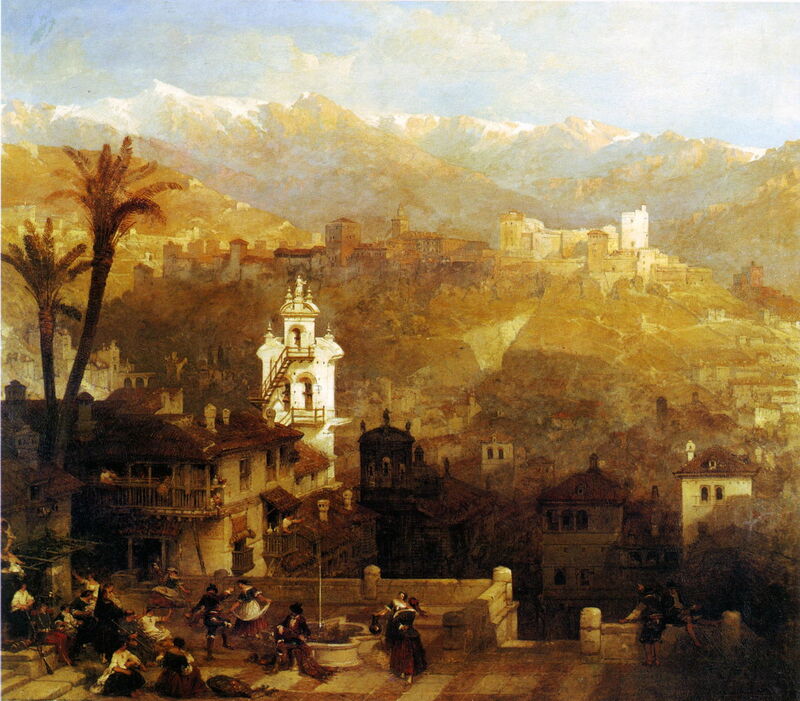 David Roberts (1796–1864), Alhambra and Albaicin (date not known), further details not known. Wikimedia Commons. It seems to have been the vogue for Orientalist views in the middle of the nineteenth century which first attracted artists to paint the Alhanbra in oils. 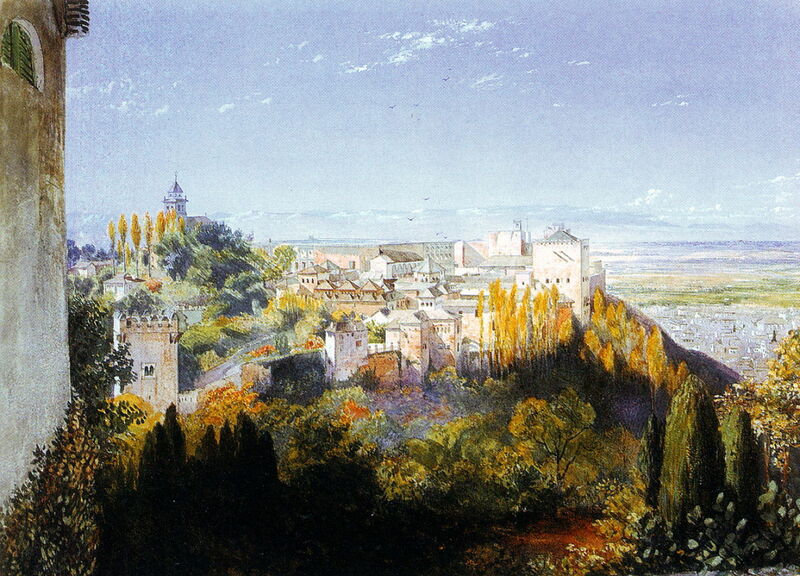 This is David Roberts’ undated view of Alhambra and Albaicin. Roberts is much better-known for his sketches turned into prints from multiple tours of Egypt and the ‘near east’ made between 1838-40. This work probably originated in sketches made when he visited Spain in 1832, and would have then been painted in this form back in Britain after about 1833, and turned into a print by 1837. 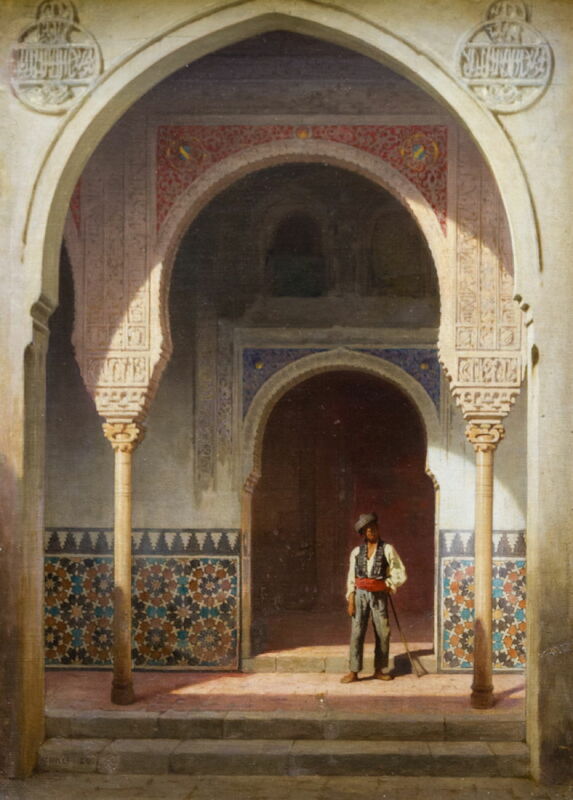 Achille Zo (1826–1901), Patio in the Alhambra (1860), media and dimensions not known, Musée des beaux-arts de Pau, Pau, France. Wikimedia Commons. Achille Zo was a Basque painter who, during the 1860s, specialised in views of Spain, such as this Patio in the Alhambra from 1860. These were very well received at the Salon in Paris, earning him a gold medal in 1868, following which he too turned to Orientalism. 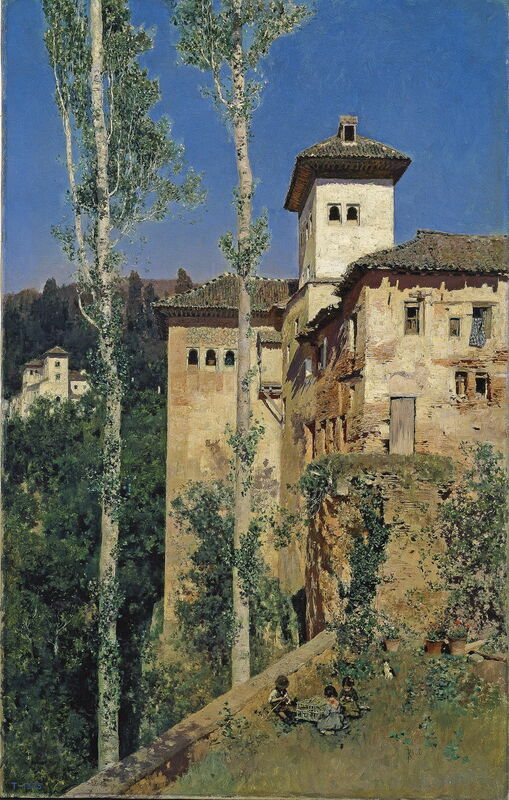 Franz von Lenbach (1836–1904), The Alhambra in Granada (1868), oil on canvas, 72.1 × 91.5 cm, Sammlung Schack, Bayerische Staatsgemäldesammlungen, Munich, Germany. Wikimedia Commons. It was probably the fine collection of paintings of the Prado in Madrid which attracted many great artists to visit Spain. In 1867, Franz von Lenbach and a student of his travelled to Madrid to copy the Masters there for his patron Baron Adolf von Schack. 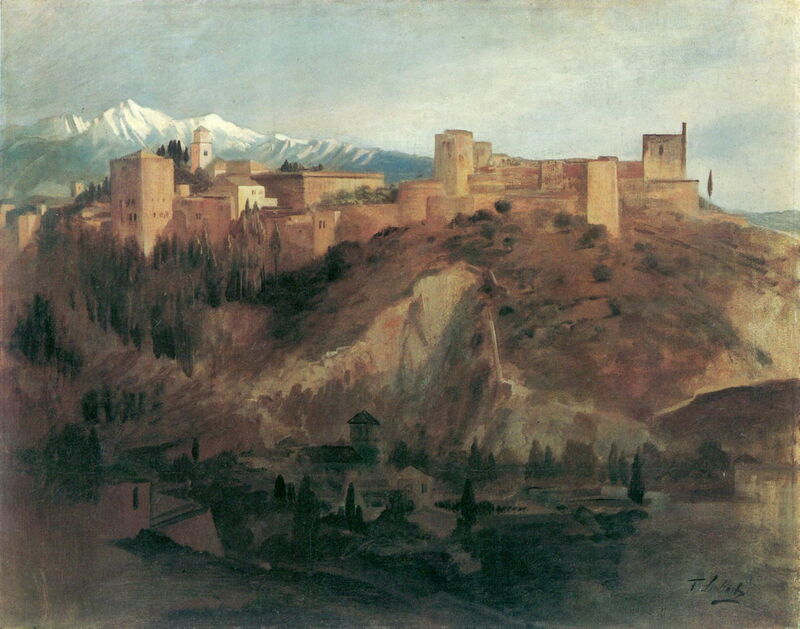 The following year, von Lenbach painted two works in Granada: The Alhambra in Granada (1868) is a magnificent sketch including the backdrop of the distant mountains, and appears to have been painted in front of the motif. Franz von Lenbach (1836–1904), Tocador de la Reina (Queen’s Dressing Room) in the Alhambra (1868), oil on canvas, 33.1 × 26.2 cm, Sammlung Schack, Bayerische Staatsgemäldesammlungen, Munich, Germany. Wikimedia Commons. Von Lenbach’s Tocador de la Reina shows the exterior of the Queen’s Dressing Room in the palaces, with his student sketching. Henri Regnault (1843–1871), Colonnade of the Court of the Lions at the Alhambra (1869), oil on canvas, dimensions not known, Musée des Augustins de Toulouse, Toulouse, France. Wikimedia Commons. Just two years before he was killed in the Franco-Prussian War, Henri Regnault toured Spain including Granada, where he painted this view of the Colonnade of the Court of the Lions at the Alhambra (1869). I suspect that this was unfinished, and that he intended to complete the detail in its lower half. Martín Rico y Ortega (1833–1908), La Torre de las Damas en la Alhambra de Granada (The Tower of the Ladies in the Alhambra) (1871-72), oil on canvas, 62.5 x 39 cm, Museo Nacional del Prado, Madrid, Spain. Wikimedia Commons. Martín Rico y Ortega was one of the most important painters in Spain at this time. Influenced mainly by the Barbizon school, he painted this finely-detailed view of La Torre de las Damas en la Alhambra de Granada (The Tower of the Ladies in the Alhambra) in 1871-72. It captures the dilapidation which the Alhambra had fallen into before more recent work to restore it to its former glory. 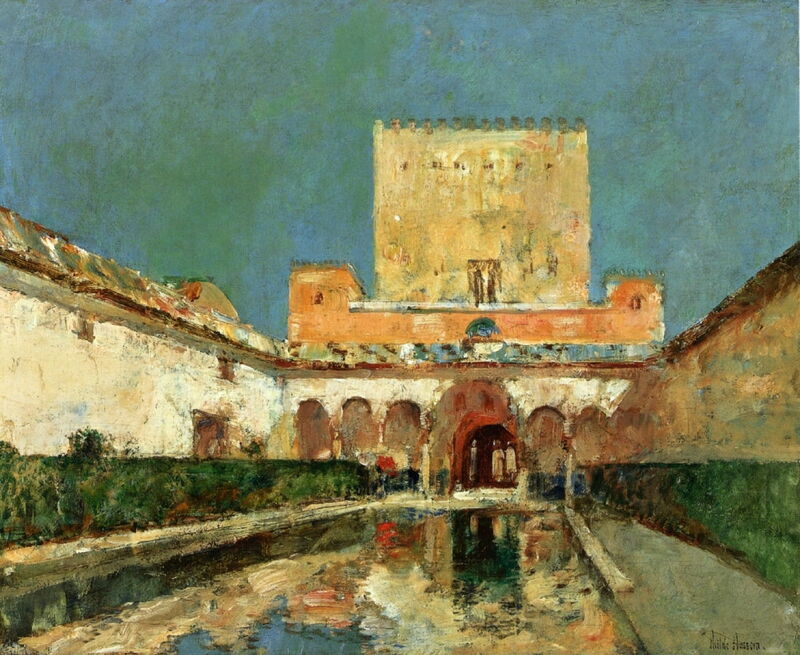 Marià Fortuny (1838–1874), Courtyard at Alhambra (Patio in Granada) (1873), oil on canvas, 111.4 x 88.9 cm, The Fogg Art Museum, Harvard University, Cambridge, MA. Wikimedia Commons. 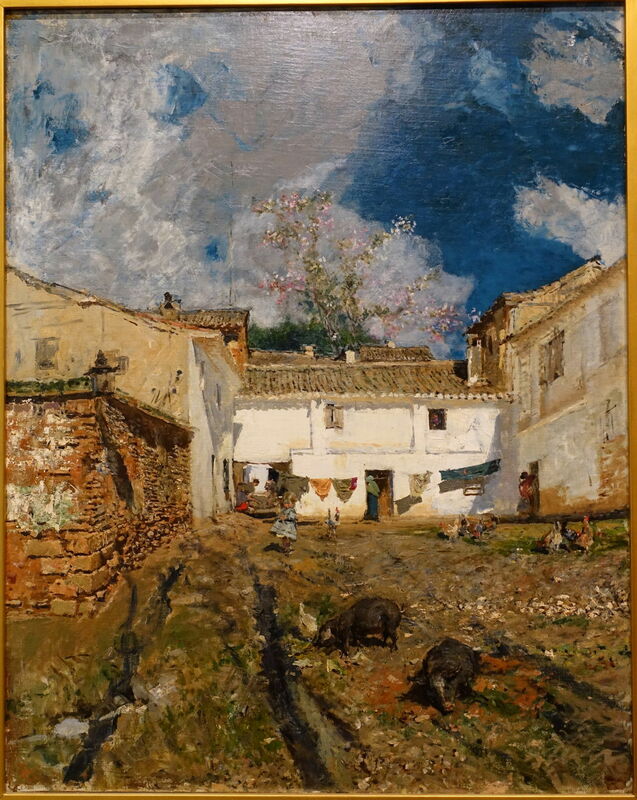 If Marià Fortuny’s more Impressionist view of a Courtyard at Alhambra (Patio in Granada) from 1873 is to be believed, some parts of the Alhambra had been turned into smallholdings, with free-ranging chickens. 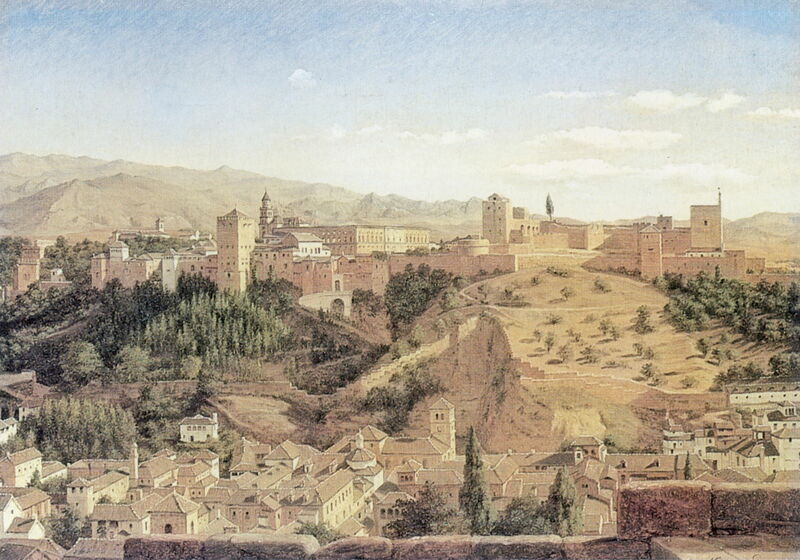 Heinrich Hansen (1821-1890), Granada with the Alhambra in the Nineteenth Century (date not known), further details not known. Image by Sir Gawain, via Wikimedia Commons. More distant views of the ridge, such as Heinrich Hansen’s undated painting of Granada with the Alhambra in the Nineteenth Century, show its imposing grandeur. John Haynes Williams (1836-1908), Albaicin from the Alhambra (date not known), further details not known. Wikimedia Commons. 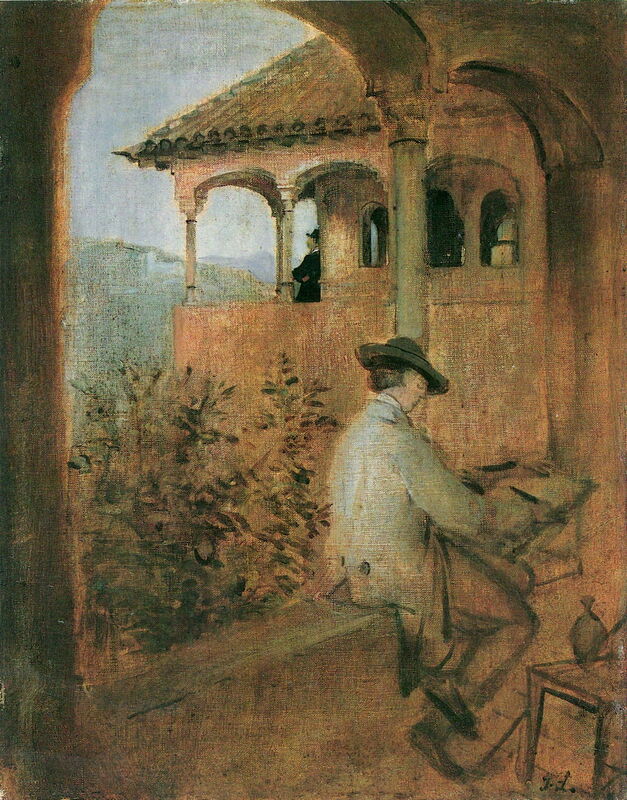 John Haynes Williams (or Haynes-Williams) recognised the merits of views painted from the Alhambra as a high point, in his undated Albaicin from the Alhambra. Childe Hassam (1859–1935), The Alhambra (1883), oil on canvas, 33 x 40.6 cm, Private Collection. Wikimedia Commons. The late nineteenth century saw new visitors to copy Masters at the Prado: those Americans who came to study painting in France and Germany. Among then, Childe Hassam visited during the summer of 1883, with his friend Edmund H Garrett, and painted this sketch of The Alhambra then. This shows the Palace of the Ambassadors, and remains one of the most frequently-painted parts of the site. Tom Roberts (1856–1931), A Moorish Doorway, Alhambra (1883), further details not known. Wikimedia Commons. 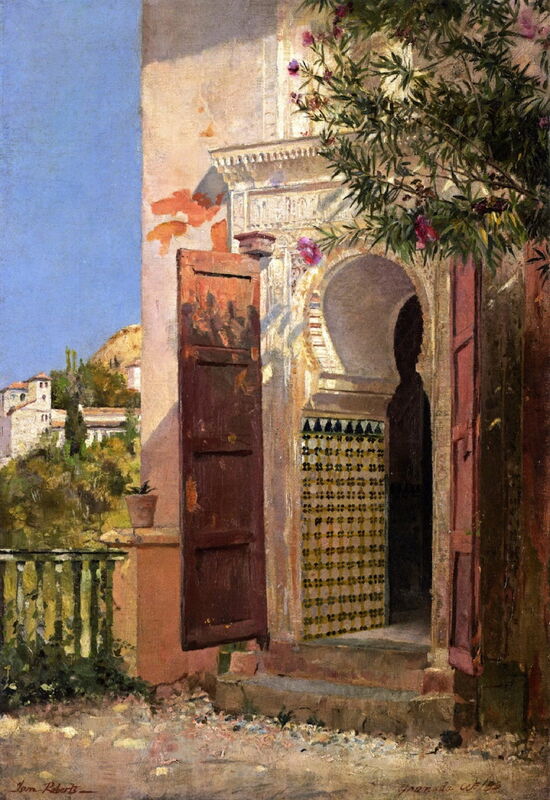 From even further afield, the Anglo-Australian Tom Roberts visited Granada when he was in Spain in 1883, when he painted this detailed realist view of A Moorish Doorway, Alhambra. Roberts had migrated with his family in 1869, returned to Britain to study at the Royal Academy Schools from 1881, then went to Spain with the Australian John Peter Russell. He returned to Australia in 1884, becoming one of the early Australian Impressionists. 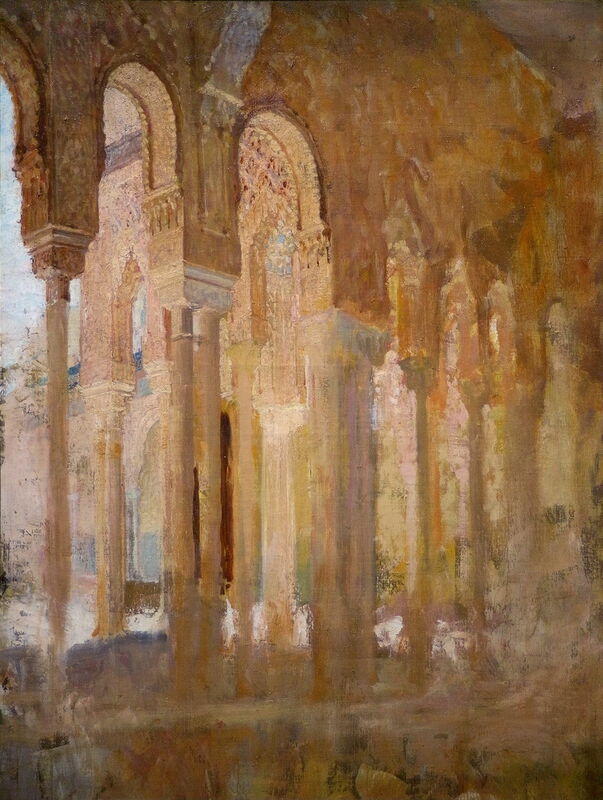 The next and concluding article considers paintings of the Alhambra during the final years of the nineteenth century, and the early twentieth, with examples from both Sorolla and John Singer Sargent. Posted in General, Life, Painting and tagged Alhambra, de Hermosilla, Fortuny, Hansen, Hassam, landscape, Lewis, painting, Regnault, Rico, Roberts, SPA, von Lenbach, Williams, Zo. Bookmark the permalink. Thank you! I m enjoying very much reading your articles. What an amazing light in the Childe Hassam painting.